Every bodybuilder could use to pack on a few additional pounds of muscle mass. Muscle growth, also known as muscle hypertrophy, is achieved through training the muscles and feeding them the nutrition they need to grow. The focus of this article will be on the training side of things. So let's look at how to train for maximum muscle hypertrophy. There are actually two types of hypertrophy. One is called myofibrillar hypertrophy and has to do with the addition of muscle mass. 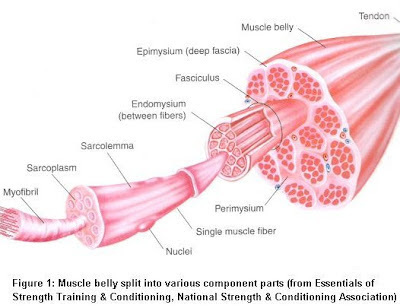 The other is called sarcoplasmic hypertrophy, which describes increasing the volume of your muscle cells. Both of these types of hypertrophy will make your muscles appear larger and fuller, but most weight lifters spend the majority of their time only targeting one or the other and wind up cheating themselves out of getting the best muscle gains possible. Myofibrillar hypertrophy is best accomplished by training for strength. This type of training is typically characterized by using heavy weights to perform sets consisting of rep volumes of 5 or less, while consistently increasing training weights for each lift. This does a great job of breaking down the muscle fibers and priming them for an increase in muscle tissue. However, it doesn't do much in terms of expanding the muscle cells to make them larger. Sarcoplasmic hypertrophy, while it doesn't actually add mass to your body, still gives your muscles the appearance of being larger because it expands the volume of your muscle cells. This type of hypertrophy is achieved by training to failure with lighter weights for a higher number of reps. This is how most beginners structure their training and is why they typically see decent results for the first couple months and then see their gains stop. Building muscle size as efficiently as possible requires combining low rep and high rep training so you can effectively target both types of hypertrophy with your weight lifting efforts. Focusing on only one will cut your results in half. A simple way to target both aspects of hypertrophy is to train heavy for a week and then train light for a week. Continually rotating back and forth in this manner will ensure that you're adding mass to your physique, while also increasing the size of your muscle cells, making your muscles grow as large and as fast as possible. This was a Guest Post by Craig Leonard. For more quality instruction for building muscle and shedding fat check out RippedOut.com.